We have another yummy post today, Rebels! And today, we are excited to share with you the details of our cake collaboration with Sugarplum Pastries. 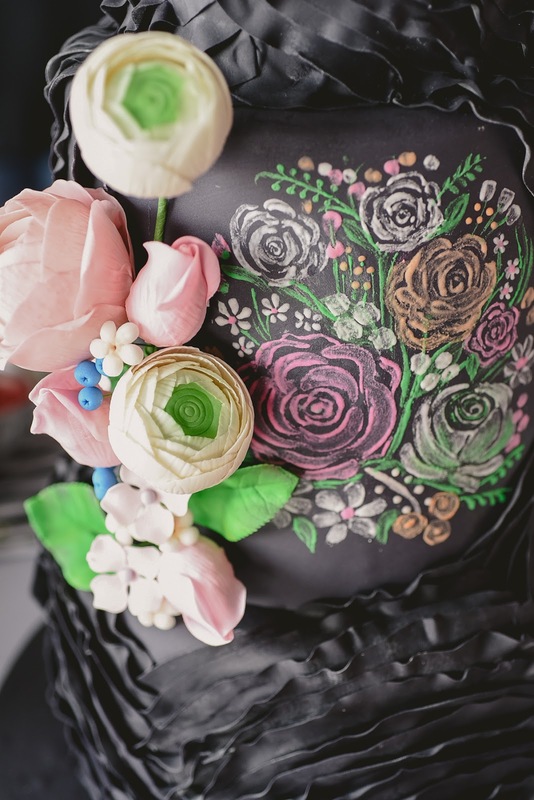 We reached out to Lovely Jiao of Sugarplum Pastries a couple of months ago, to work on a 'bomb' cake idea. We've seen their work before and just really loved their creativity. And we wanted to see if it was possible to make a black cake that would look like chalk doodles were written on it. Lovely fondly calls this cake, "The Bad Girl." Which is such a cute and fun name, and something you would definitely NOT expect a wedding cake would be called lol. "Bad Girl" is a 3-tier, 10" diameter banana walnut (my personal favorite) edible base; with a 8x6" diameter dummy layer fondant cake. 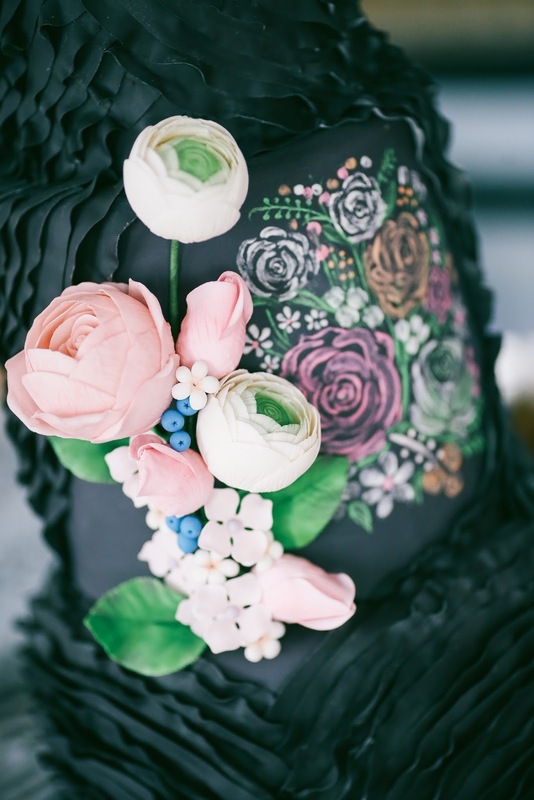 It has a delicate and careful ruffle combination (this is one of our strengths), precise hand-painted middle layer, with one-sided crafted gum-paste flowers. The color of the cake -- that in itself is out of the ordinary. But I must admit it was very challenging too. We were just starting then with our watercolor-era, and of course we were a bit skeptical if it would fit the overall look since it's black. 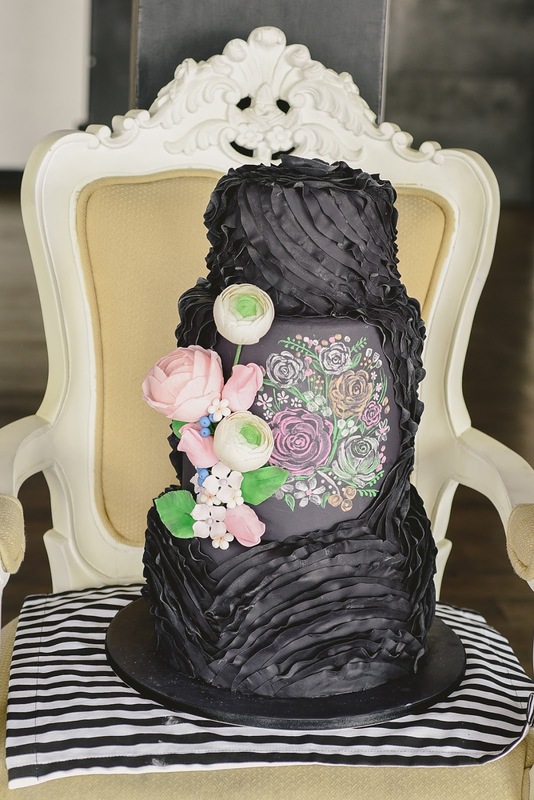 Yet it was excitingly fun and we couldn't help but wonder how people will perceive a black wedding cake. The cost to have a "Bad Girl" cake like this made is P15,000.00 (as of this writing). Which is a competitive price considering how much wedding cakes go for nowadays. Plus you could totally see that this cake is high in quality, it is so unique, and quite delicious too! What do you guys think of this wedding cake? Is it something that you might consider?